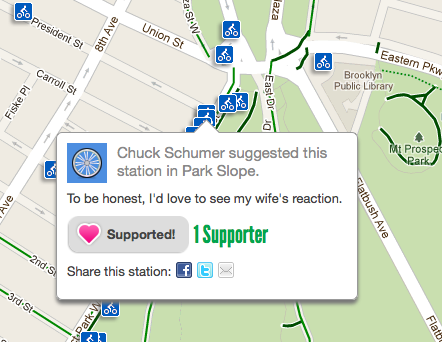 People are having a bit of fun with the New York City Bike Share station suggestion map. Zoom in on Park Slope and check out the growing number of suggested stations clustered around 9 Prospect Park West. You know who else loves bike sharing? Our Borough President! There’s a bike share station request for One Police Plaza and another in the middle of the Prospect Park Lake. If you find any more fun ones, please post a link in the comments. Sean Sweeney wants a bike share station in SoHo!